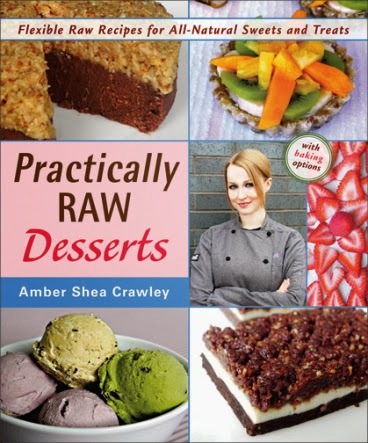 When Dianne asked me about reviewing Practically Raw Desserts – Flexible Recipes for All Natural Sweets and Treats, by Amber Shea-Crawley, I was initially skeptical about how many recipes I would be able to try and also like. Some raw recipes I have seen on the Interwebz have been quite extensive in terms of work as well as time and Hubbs isnt much fond of raw desserts much either. But this book and Amber’s earlier book have changed that game. Consider me converted Amber. This book offers an amazing variety of desserts with each recipe being very flexible. Most recipes have options to make them raw, baked, or easy freeze or other methods, which makes them very approachable. I do not have a dehydrator and the baked options made me very happy. There are several options for substitutions for most of the ingredients. Also all recipes are free of dairy, eggs, gluten, wheat, soy, peanuts, corn, refined grains, refined sugars, yeast, starch, and many recipes are free of grains, oils, nuts, and added sugars too making them quite a nutrient dense treat. I made a bunch of goodies from the book and so many more bookmarked. The Strawberry shortcupcakes, Dulce de Leche spooncream, Carrot Cake! and Confetti Birthday cake. so pretty, intriguing and I bet delicious! These Raw Baklava blondies are a great snack filled with many nuts and dates and raisins. The book has amazing amount of information packed into it with recipes for basics, pantry list, equipment guide, nut milks, nut soaking guides, and substitution options and so much more. Almost All recipes have a picture, which is very helpful to get an idea of how the recipe will turn out. There are Cookies, Bars, Cakes, Pies, Puddings, Candy, and frostings, glazes, ganaches. The book also has a resource guide provides information on where to source ingredients. I do have a high speed blender, but no food processor. The baklava and lemon curd came out of my magic bullet! Coconut Lemon curd was a big hit. 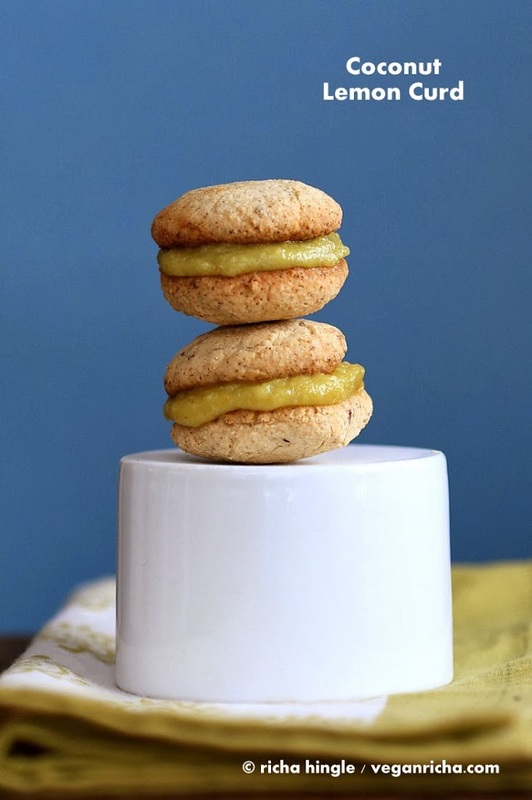 I made sandwich cookies with some of the leftover curd after licking most of it while I prepped and photographed, with my gf sugar cookies for a fantastic lemony whoopie! Thank you Dianne Wenz and Vegan Heritage Press for providing me with a review copy of Practically Raw Desserts. And thank you Amber for all the work that went into this book. These dark chocolate darlings are so low-cal and low-fat, they actually would make a perfect midnight snack, but it is their deep cocoa color and flavor that gives them their name. They’re also perfect for dipping into a good cup o’ joe in the morning! The coffee extract is optional, but it works wonders at bringing the mocha flavor to the forefront. Make It Raw: Using a cookie scoop or a spoon, scoop the batter by rounded tablespoonfuls onto a Teflex-lined tray. Use a fork to gently flatten the cookies to 1/3 to 1/2 inch thick, leaving fork marks in the center. (They may crack a little at the edges; that’s okay.) Dehydrate at 110°F for 1 to 2 hours, flipping the cookies over halfway through, until they have firmed up slightly. Make It Baked: Preheat the oven to 300°F. Using a cookie scoop or a spoon, scoop the batter by rounded tablespoonfuls onto a parchment-paper-lined baking sheet. Use a fork to gently flatten the cookies to 1/3 to 1/2 inch thick, leaving fork marks in the center. (They may crack a little at the edges; that’s okay.) Bake for 8 to 9 minutes, until the bottoms of the cookies brown slightly. Use a spatula to move the cookies to a wire rack and let cool before handling. Make It Easy: Using a cookie scoop or a spoon, scoop the batter by rounded tablespoonfuls onto a waxed-paper-lined plate or baking sheet. Use a fork to gently flatten the cookies to 1/3 to 1/2 inch thick, leaving fork marks in the center. (They may crack a little at the edges; that’s okay.) Enjoy immediately, or refrigerate or freeze until firm. Store the cookies in an airtight container at room temperature for up to 4 days, in the refrigerator for up to 2 weeks, or in the freezer for up to 2 months. Chef’s Tip: Don’t be shy about adding extra liquid (water, coffee, or nondairy milk) to the batter as needed to help the dough become moist and scoopable but still moldable. • Double Chocolate Mocha Cookies: Pulse some nondairy chocolate chips or cacao nibs into the dough. • No Caffeine at Midnight! 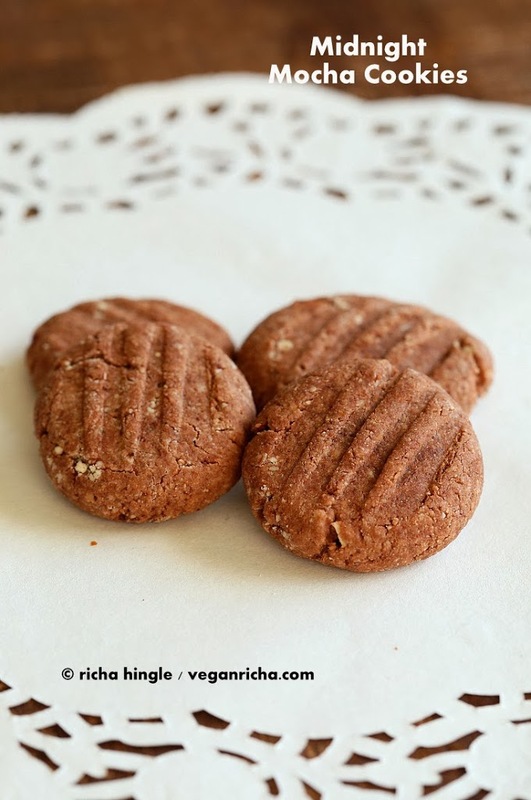 Cookies: Use water or non-dairy milk in place of coffee and omit the coffee extract. From Practically Raw Desserts by Amber Shea Crawley. ©2013 Amber Shea Crawley. Used by permission from Vegan Heritage Press. Vegan Heritage Press has kindly offered a copy of the book to one of the blog readers. This giveaway is open to US residents only as per publisher’s request. Please enter the Giveaway in the Widget below. I recently went vegan. I love cooking and am confident that I’ll be able to make all this happen, but I’m a little stunted right now. I’m trying to figure out a meal instead of just piling veggies on top of each other. I love raw wraps in the dehydrator! wow this is just a great book. I have been trying to do more raw dessert lately. I’ve heard a lot of rave reviews of this book and your pics certainly make it live up to its name! You know I’m off the sweet stuff right now but I love the adaptability of these recipes. These cookies sound so good. Will have to share with my gluten-free friends! Thank you so much for the lovely review, Richa – and what gorgeous photos! Raw carrot cake is THE BEST! I pretty much need the baklava blondies. The Baklava blondies look amazing!! These really look delicious. Is there a substitute for coconut nectar? Ive been looking for this book at the library!! I’m new to the raw scene, but my favorite raw snack is banana chips. Great looking recipes! Thanks for a nice Giveaway! grated cabbage, Vegan mayo, 1 grated carrot, grated peppercorns-mix, refrigerate–enjoy! I’ve had the same fave since I was a little kid and I would get no bake bars as desert for my school lunch. Still love oats and chocolate. Since it’s almost midnight here, does that make it acceptable to start making these cookies now? LOL!! I am into raw cheezecakes at the moment. This book looks very interesting! I can’t even think of a favorite right now because I’m dying to try the baklava blondes! I haven’t tried these yet – – how silly of me! I love vegan taco casserole. 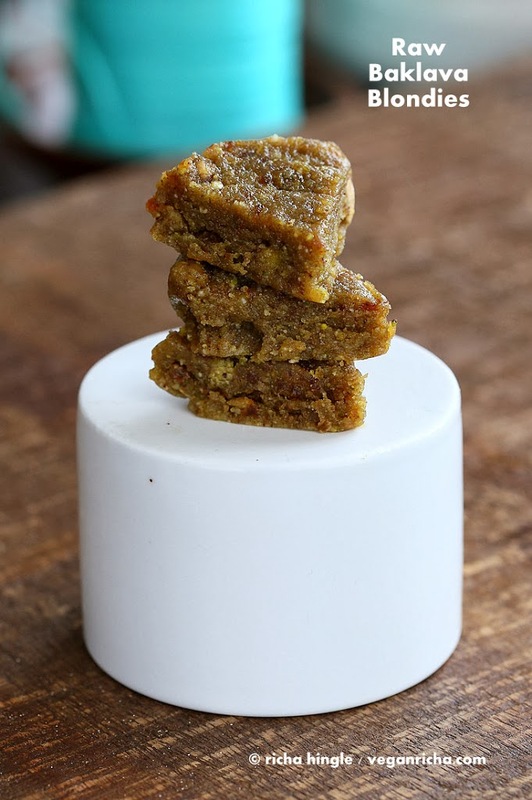 I’ve had very mixed results with raw cookies before, but Amber’s recipes have never failed me, so will definitely put this recipe on my list of treas to try! Besides that, I do have some coconut sugar that I’ve been dying to play around with, and this sounds like an excellent excuse. my favorite raw recipe would have to be any kind of raw cheesecake! I’m currently loving chocolate avocado pudding! Hey, When I saw through your blog back to the beginning. 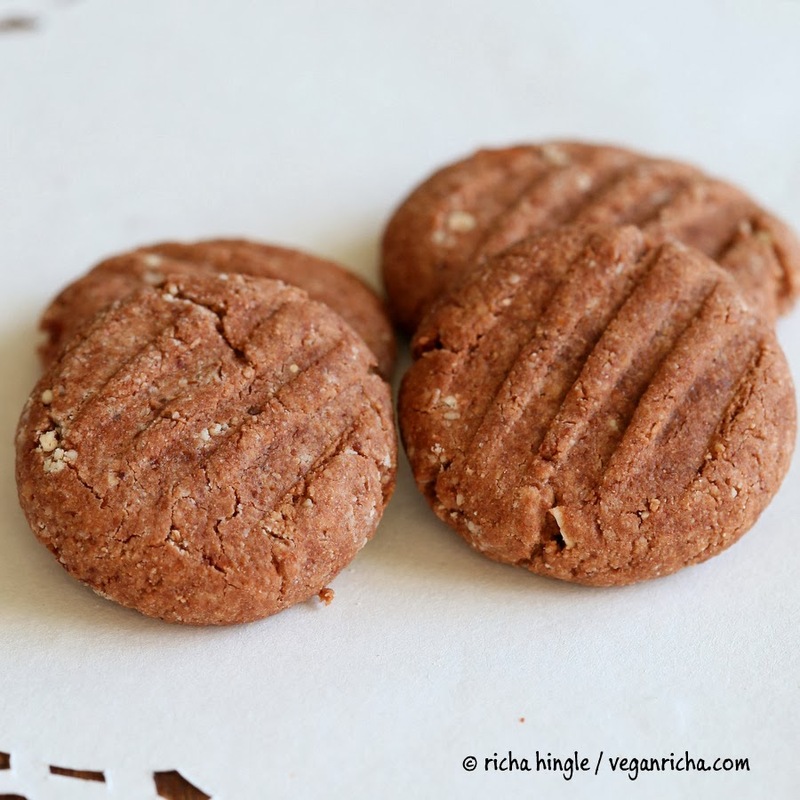 I loved looking at all the photos of your Mocha Cookies & Practically Raw! It truly is beautiful & your work is amazing! I loved seeing how you made the molds! I want to talk you about Culinary schools. The first one is a typical Sue chef that is turned into a plate finish of healthy value. It still preferences delightful, and importantly it is as excellent as its classic counterpart, but does have less calories and less fat. The secret component of this lighter Mac and Cheese is pureed winter squash. I also made some raw mint mojito balls once that were delicious!! I love that this book features a raw and cooked version….I too do not have a dehydrator and appreciate that feature!